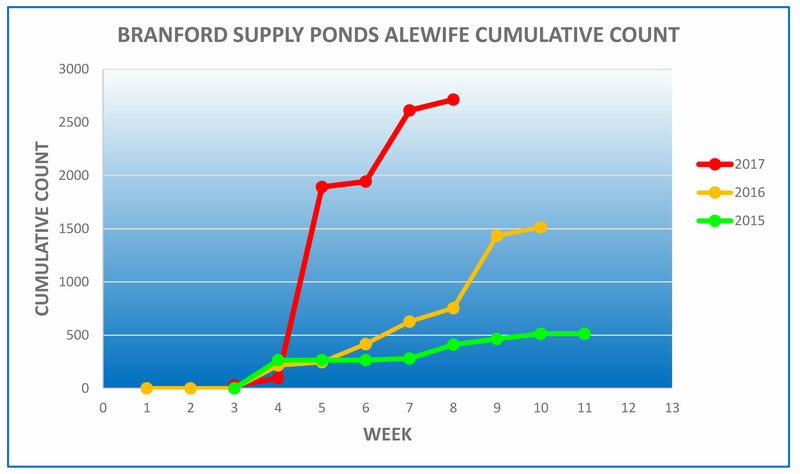 The fish counter continues to register alewives making their way up the Supply Ponds fishway with 102 additional fish being counted for the week ending 5/9/2015. Based on alewife runs in previous years, we might be approaching the end of this season’s run. The next few weeks should see a decrease in the number of fish making their way up the fishway. From I-91, take exit 40 to Rt.20 (Bradley Airport Exit). Travel west to the Hamilton South exit. At the end of the exit ramp turn left. Turn right at the first intersection on to Rainbow Road. The fishway is on the left about a quarter of a mile down the road. Look for a cyclone fence and a brown sign with yellow lettering.